Before we relate this interesting, real-life account, here’s a little about building bridges and Pioneering: To open up the frontier, pioneers built BRIDGES. To this day, the most familiar and most functional of all “larger” pioneering projects are bridges. In the older edition of the Pioneering Merit Badge Pamphlet, pioneering legend Adolph Peschke provides details for five “boy-sized” projects. 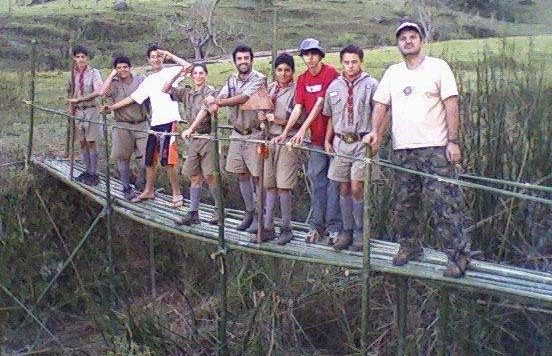 Four of them are bridges: (Double A-Frame Monkey Bridge, Single Lock Bridge, Single Trestle Bridge, Single A-frame Bridge). “With your knots and lashings down pat, you’re ready for one of the most exciting outdoor crafts going: pioneering—building structures of timbers for practical purposes. It tests many skills, including teamwork. Probably your first try ought to be a simple project—but you may get your gang really steamed up by the notion of a bridge to avoid a long walk around a gully, stream, or pond on your campsite. So bridge it! “LOCK BRIDGES are used for spanning streams with steeply sloping sides. 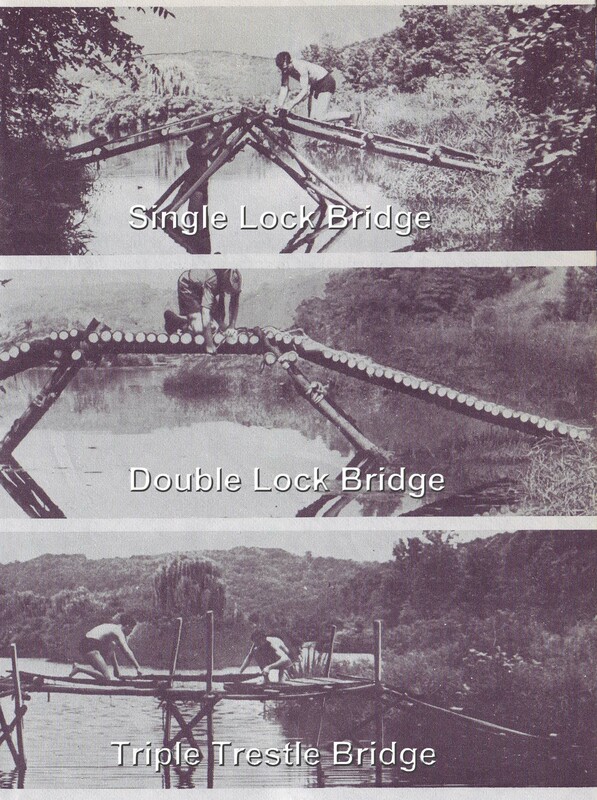 If the stream is narrow, use a single-lock bridge (top right), consisting of two trestles and two roadways. For a wider stream, build a double lock bridge (center) in which the two trestles that are placed in the water are locked into a horizontal trestle that carries the center section of the roadway. “It steadily worsened; the mountain stream was now a raging torrent, bringing down boulders, tree trunks, and great lumps of what had been the bank. The ford had vanished completely and in front of us was a chasm or ravine about twelve feet deep with a raging torrent tumbling along its new course. “There was no other way out of camp. We could have stayed and we could have managed, but it would have been hard on the woman and children who were our guests. We could have thrown a foot bridge across the ravine but then they would have been faced with abandoning vehicles and a very long and tiring walk to the nearest habitation. “Unanimously it was decided that we should build a bridge; not a foot bridge, not a monkey bridge, not an aerial runway, but a road bridge which would carry the vehicles, the equipment, and the people. “And so began the Saga of the Bridge of Fifteen Nations, for the men of fifteen nations contributed to its building. Mercifully equipment was available and there was a large supply of timber. The hands were willing, experienced, and capable. The men knew their knots and lashings and their basic pioneering. “Three hours later, as darkness began to cover the area, the first car—a little Renault—gingerly felt its way across the bridge. As it accelerated up the bank on the far side of the ravine, the cheers from the men of fifteen nations were united, vociferous, and heartwarming. We were wet and tired; some of us were bruised and battered, and some had minor cuts, but spirits were never higher. Within the next half hour, every vehicle and every person made their way across the bridge and so onward to Mexico City; perhaps a little later than expected, but Mexico is one of the countries of ‘manana’, so why be concerned about slight errors in punctuality?